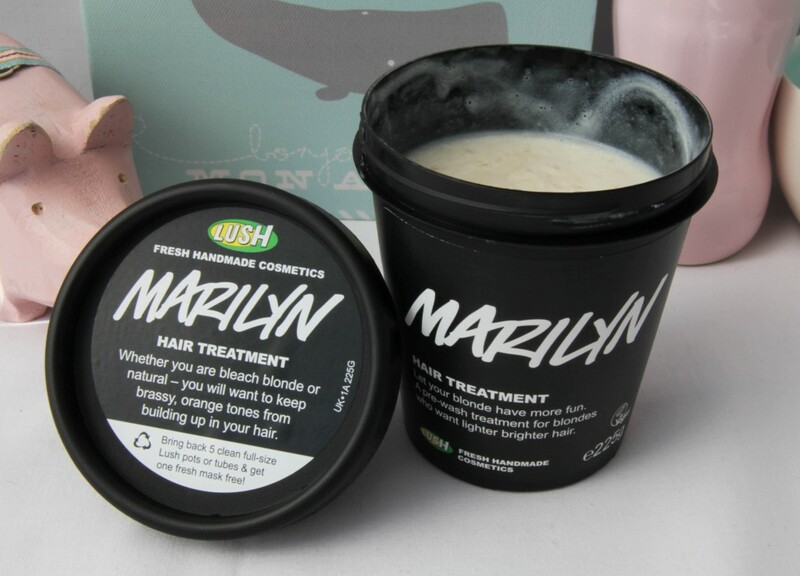 Today I’ll be reviewing the Marilyn Hair Treatment from LUSH for you guys. Let me first tell you a very sad story… As you guys know the last time Neal and I went to Cape Town (in June), we actually only went on holiday because I needed to experience LUSH for the first time in my life. I still get the chills whenever I think of a LUSH store. Anyway, so we tested, sniffed and chatted to the sales ladies and I bought quite a few things (one of which was this Marilyn hair treatment). I was so excited when I bought this because 1. I love Marilyn Monroe (I went through a phase where I was obsessed with her) and 2. it smelled amazing and the sales lady promised me it would do wonders for my hair. On the day we left Cape Town to fly back to Johannesburg, I packed all my LUSH goodies in baggies to ensure nothing leaked into my suitcase. Toodlebrain here, however, did NOT make sure the screw top of this tub was screwed on tightly. Before we packed our suitcases into the car to head to the airport, Neal suggested we just check the LUSH stuff one last time. And this, dear ladies, is why I love my husband. When he took out the baggie containing this treatment tub and a few other LUSH products, we saw that it had leaked. I was beyond myself, to say the least. Only a couple of tablespoons had leaked out (you can see in the picture below, that’s how much was left after this fiasco) but I was gutted. You know when you’re in the mode and things feel 1000 times worse than they actually are? Well, that was me. Neal said we could stop at LUSH on our way to the airport again (and that’s another reason why I love this man) but I was too despondent and just wanted to get home. I’m such a brat… Anyway, on with the review! What it contains: Chamomile for lightness and to calm your scalp, saffron for golden colour and lemon for shine. This treatment also contains SLS (Sodium Laurel Sulphate) as well as parabens which doesn’t make it preservative-free. My review: This treatment is a pre-wash treatment, meaning you saturate the hair with product and leave it in for about 30 minutes. Then rinse and follow as per normal with your shampoo and conditioner. The very first time I used this pre-wash treatment I left it in for about an hour, and then washed my hair with the LUSH Godiva shampoo bar and followed with the LUSH American Cream Conditioner. I was VERY impressed with how my hair felt after this particular wash. I blow-dried my hair and it was full of volume and felt super soft to the touch. I didn’t really notice any difference in the tone of my hair after the first wash but didn’t expect to since I knew it would probably take a few treatments before I really saw results. The second time I used the treatment, I didn’t follow it with any LUSH products (I followed with the Lee Stafford Big Fat Hair Shampoo and the Lee Stafford Beach Blondes Conditioner) and my hair didn’t feel as soft as it had the first time I used this. Proof that this little tub works well with other LUSH products but not really with products from other brands. I’ve also noticed that I need quite a bit of product to cover my whole head of hair so I’d say if you have medium to long hair, you’ll probably only get 3 to 4 treatments out of the tub. I only have enough product left for one treatment and although I have noticed a difference in the texture of my hair (it’s less dry), I don’t think it has lightened or increased the vibrancy of my hair. The pro: When used with other LUSH products, it really leaves hair feeling soft, shiny, full of body & revitalised. The con: This treatment didn’t really deliver on what it promises to do, my hair didn’t get lighter and it also didn’t really bring out the natural blonde tones in my hair (be it the highlighted sections of my hair, because I don’t expect it to lighten my roots as my natural hair colour is light brown). Also, considering you only get about 4 uses (max) out of the container, it feels like it’s not really great value for money. The price: R 125,00 for 225g. Firstly, how awesome is Neal? So sweet of him. I think Eric would also understand my despair. The day I bought my LUSH stuff we were walking around and had cocktails and it was blazing hot. I kept moaning that my stuff was going to melt. Ha, ha. I would have been just as miff as you. Hahaha! I have the worst luck with these types of things too, anything that can go wrong…will go wrong! Not usually a fan of these type of products :/ Great review and thanks for the heads-up. Btw. i also went through a Marilyn phase….. i was obsessed to say the least! I LOVE treatments for the hair, especially these ones you use before you shampoo. I used to use only coconut oil and let it sit for like 5 hours and then discovered this – total fail! Love Marilyn, she’s the epitome of a woman! My bf went to Cpt a few weeks ago & I made him bring back some LUSH things for me – thank you for introducing me to it!!!!! I didnt get the Marilyn treatment thing becoz I have red hair but did get another treatment called Roots – its amazing for thinning hair Luzanne! Just discovered you blog! I LOVE it! YES i love coconut oil! i use it for everything. On my face, in my hair, shave my legs etc. Sometimes i put it in my hair, shower cap on, and then blow with hairdryer for a hot oil treatment. it is fantastic. Wow! Never done the whole heating it up with a hairdryer thing – will DEF try it out this weekend!